Ever wished for something, but figured it was more or less impossible? It runs on eight AA NiMH batteries – for five hours. It weighs just 7.4 kg (that’s just over 16 pounds). 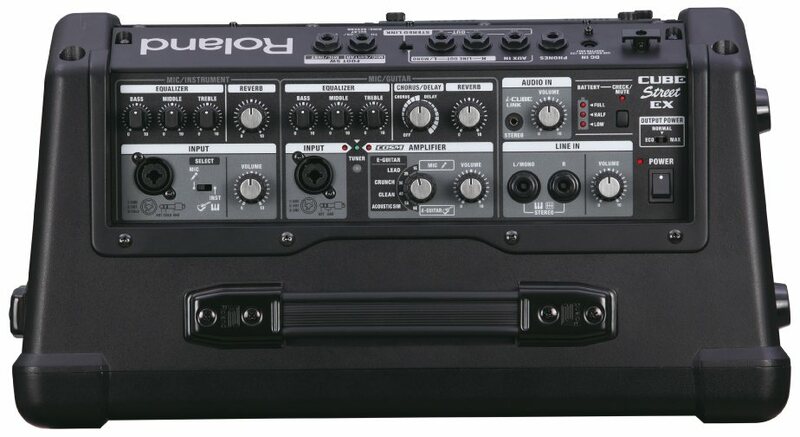 It connects whatever you want – two XLRs, four independent channels, for any combination of instrument, vocal, laptop. It’s angled, so you can use it as a stage monitor. 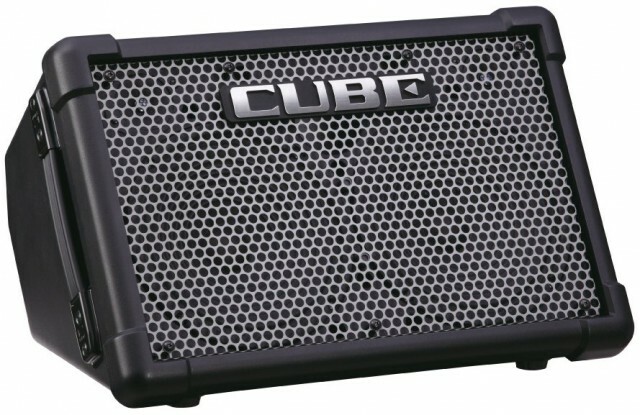 It has a mounting hole, so you can put it on a stand like a PA – and you can easily connect two together for a stereo PA.
It’s got a strap, so you can pick it up and carry it around like a normal amp (there’s even a water-repellent carry case. An extra jack lets you record to a mobile device (three-pole connector), as with Roland’s app for iPhone and iPad. There are some extras, too: you get guitar tones (Clean, Crunch, Lead, Acoustic simulator), chorus/delay, and reverb effects, all with footswitch controls, plus a built-in tuner. Or you can plug in an acoustic to an AC preamp for an uncolored sound. 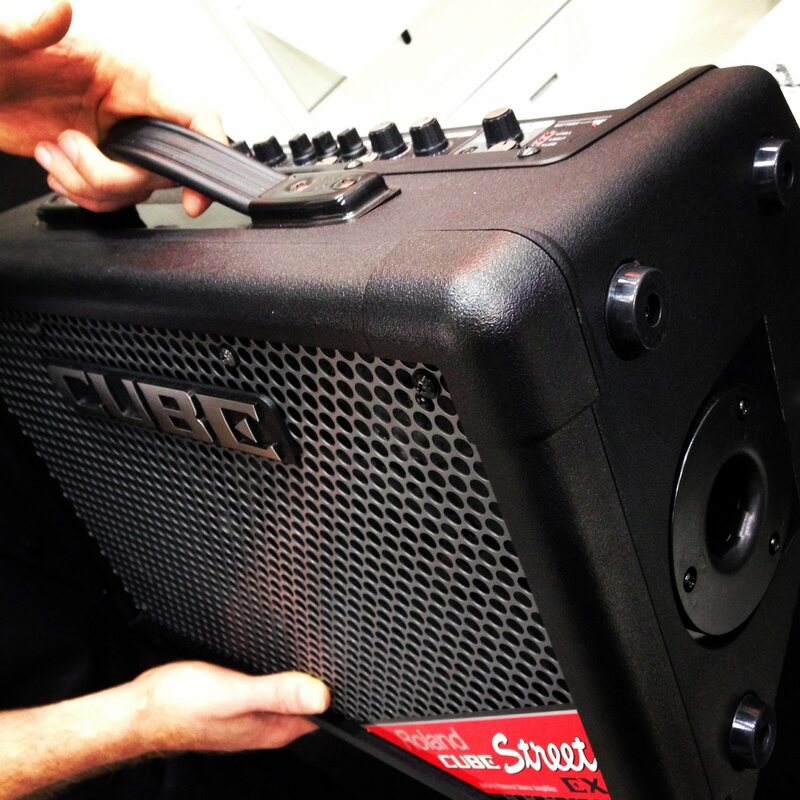 So, let’s get this straight: it weighs nothing, runs on batteries, adds effects, connects anything, lets you busk, gives you a PA, or gives you a floor wedge. Is that actually even possible, or was this marketing nonsense? I spoke to a number of builders who ultimately said, yes, it was – if difficult (particularly at this weight and power draw). “50 watts” of power is presumably a measure of the resulting sound. (Roland says it’s “50 watts of stereo power.”) For that, they add two eight-in woofers and two tweeters, all using new power circuitry. 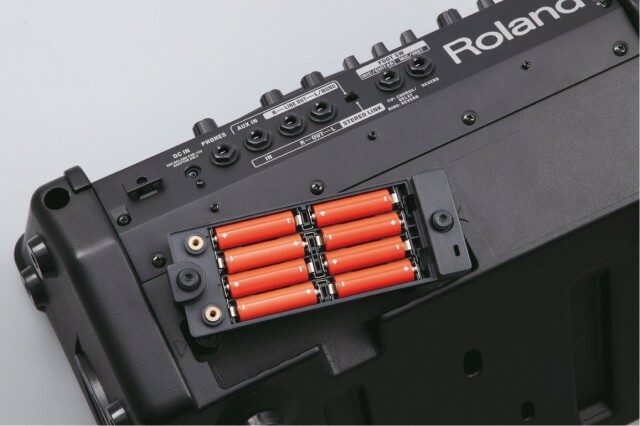 And Roland tells me this is really new tech, not the past battery-efficient stuff they’ve done. If you want more battery life – most likely because you’re using it as a practice amp – you can dial back to Normal 25W or Eco 10W modes to get up to 20 hours. The other caveat may be that this isn’t likely to be cheap – I was hearing around 500€/$, but will confirm that. A trade show floor isn’t a great place to test audio quality. I will absolutely get one of these to test. To me, out of everything I saw at Messe yesterday, this was the product that promised the most everyday usefulness. I can’t wait to find out if it delivers.